The Orange Key just got better. 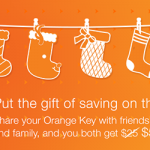 For a limited time (they don’t say when), along with a FREE $25, you will now earn 2.50% on your savings when you sign up for an ING Canada account using another account holder’s Orange Key. And since I told you about it, here’s mine. Both the new account holder and the referring account holder benefit the same way from this offer. Here are a bunch of reasons I like this bank. Same goes for if you refer anyone using your Orange Key any time after signing up. You earn $25 for every person, and they earn just for signing up. I am not endorsed by ING in any way, I just like money and I’m sure you do too. Also, this is the only bank that has never made me pay a fee for anything. Go ahead. Make $25. A few times over, if you can. Share the post "Need money? Get $25 + 2.50% Interest on Savings through ING Direct Canada"